Christmas is around the corner and every year more people are traveling to Stockholm in December to visit the Christmas markets and activities prepared in the city as well as New Year’s Eve celebrations. This article lists some Christmas markets – julmarknader in Swedish – both for those of you looking for a traditional experience and for those looking for something different. Skansen’s Christmas market is one of the best and most genuine in Stockholm with more than 110 years behind it. Not only the market itself but the location with the old buildings surrounding you and the presence of animals provide the market with a totally different environment. 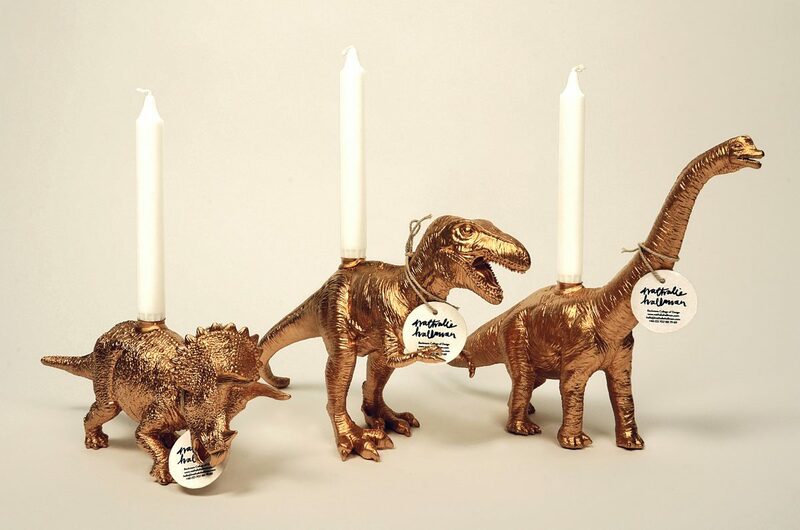 There are also exhibitions about how Christmas was celebrated in the last century by the nobility and at private homes. 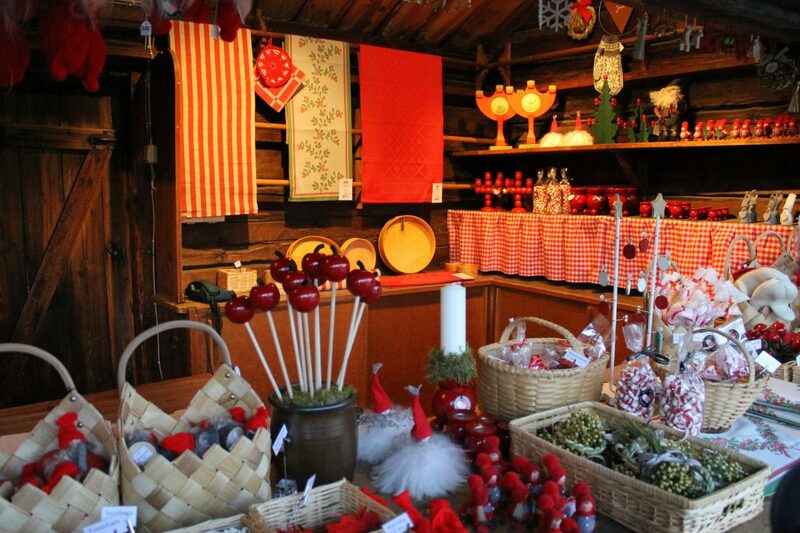 Skansen’s Christmas market runs from 11/24 to 12/16 from 10:00 a.m. to 4:00 p.m. on Saturdays and Sundays. Admission costs 120 SEK for adults and 60 SEK for children but included if you buy your Stockholm Pass tourist card. If there is a typical tourist picture of Christmas is that of the colorful houses of the Stortorget square illuminated by the lights of the Christmas market in Gamla Stan that are reflected in the snow accumulated on the ground. This is the Stockholm’s second market par excellence. Its central location and the cozy and romantic atmosphere of Gamla Stan in winter attract many Olmians and tourists alike. Up to about 200,000 per year they say. 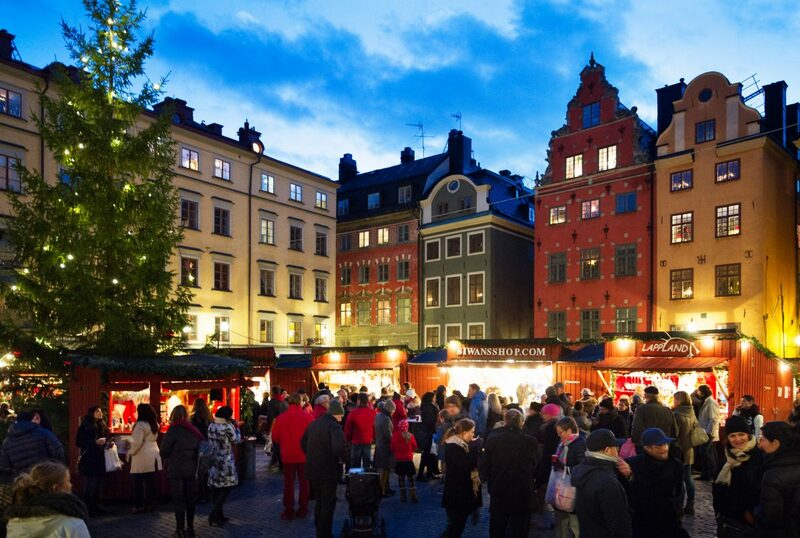 As if that was not enough, Gamla Stan’s Christmas market is the oldest in Sweden, starting in 1837. Here you can find candies, decoration, crafts and much more in some cabins that claim to imitate the existing stalls in the market during Middle Ages. In 2016 the newspaper The Telegraph placed it among the 10 best Christmas markets in Europe. In 2018 it is open daily between November 24 and December 23. Remember also that in this time of the year you can take guided Christmas tours in Gamla Stan carrying a lamp or experiencing the spirit of Christmas in Stockholm . If you could only visit a Christmas market in Stockholm, Gamla Stan or Skansen should be your choice. If you travel to Stockholm with children the market at the Royal Stables (Konungens hovstall or Hovstallet) can be ideal for them because besides the typical market stalls with crafts, decoration and organic products there is also the possibility of riding a pony, visit the stables and know the horses and carriages of the king. This market is located next to the Royal Theater in Nybroplan on Väpnargatan 1 street. In 2018 it opens between Friday 11/30 and Sunday 12/2. Drottningholm Palace, a UNESCO World Heritage Site, becomes the perfect setting for a Christmas market on the Island of Lovön on Lake Mälaren just outside of Stockholm. It is held on the second weekend of Advent that in the year 2018 corresponds to December 8 and 9 and is focused on attracting Swedish artisans and small-scale food producers coming from all corners of Sweden. Bondens Egen Marknad is the farmers’ market located in SoFo, south of Folkungagatan street in Södermalm, and it opens on the four Saturdays before Christmas which in 2018 are: 12/1, 12/8, 12/15 and 12/22. Students of fashion, design and visual communication have their own Christmas market where they sell unique products that come from their creativity. There is also a Christmas fika in the cafeteria. The Christmas market at Beckman School is on December 8 and 9, 2018 between 10:00 AM and 5:00 PM at Brahegatan 10 near the Östermalmstorg metro stop. The little village of Sigtuna, well worth a visit, to the northwest of Stockholm has a very interesting Christmas market to attend. In 2018 it takes place on Sundays 11/25, 12/2, 12/9 and 12/16 between 11:00 AM and 4:00 PM. You can reach Sigtuna by public transport from Stockholm by suburban train (from Stockholm Central Station to Märsta Station) and from there by bus (570 or 575 to Sigtuna busstation). It takes around 1 hour and 15 minutes. 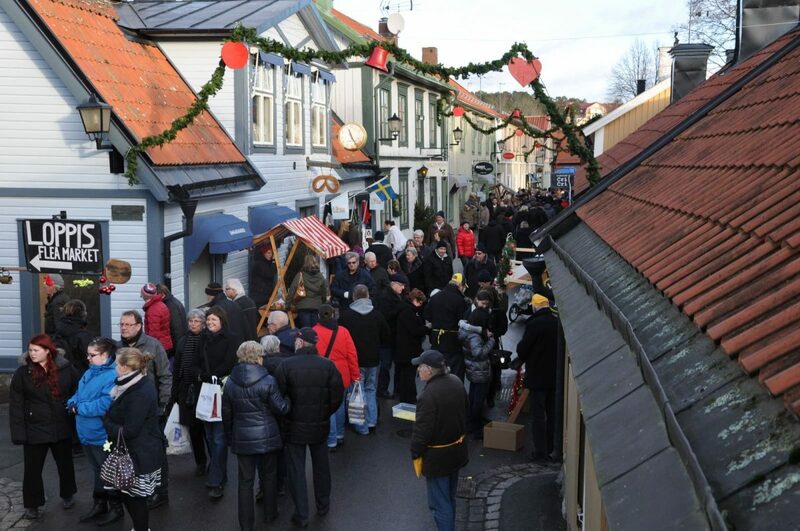 Besides this big Christmas market in the city center there are several markets in Sigtuna during November and December. For those who want to visit the archipelago of Stockholm in December there is a great way of doing it by visiting the Christmas market on the island of Utö. In 2018 it is held on the 2nd and 3rd and on the 8th and 9th of December. To get to Utö, which belongs to the municipality of Haninge, you have to take the suburban T35 to Västerhaninge. From there get on the bus 846 to Arsta havsbad and from there the ferry (paid separately) to Gruvbryggan whose schedules are synchronized with those of public transport. This market is not located in Stockholm but about 60 km to the west in Taxinge Castle. This market competes every year with the Christmas market at Liseberg in Gothenburg to see which is the largest market in Sweden because Taxinge has more than 130 stalls with traditional food and crafts. In 2018 the market is held from November 15 to 18 and from November 22 to 25. If you will be renting a car for your trip to Sweden, Taxinge Christmas market can be an interesting place to visit. These are some of the existing markets in Stockholm and surroundings but there are many more. If you travel on a specific day in November or December and you need to know if any other market is being held on these dates write me a comment below and I’ll try to help you.